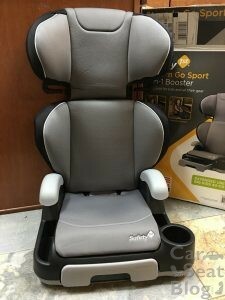 Home » Reviews » Safety 1st Store ‘n Go Sport Booster Review – grab your gear and go! Safety 1st Store ‘n Go Sport Booster Review – grab your gear and go! 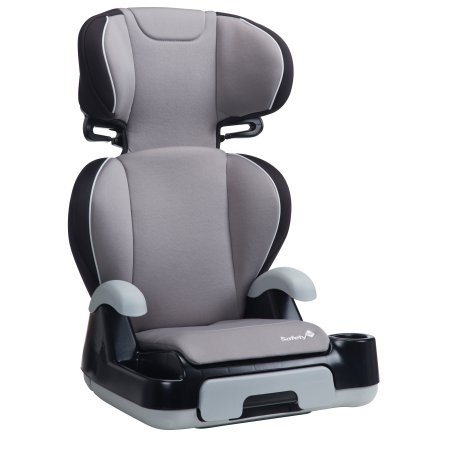 The Safety 1st Store ’n Go 2-in-1 has been around for a few years and is one of the more popular options for tall kids. It fits a variety of grade-school age children due to its unusually generous height capacity. The Store ’n Go Sport 2-in-1 offers many of the benefits of the original Store ‘n Go, with a lower price tag. 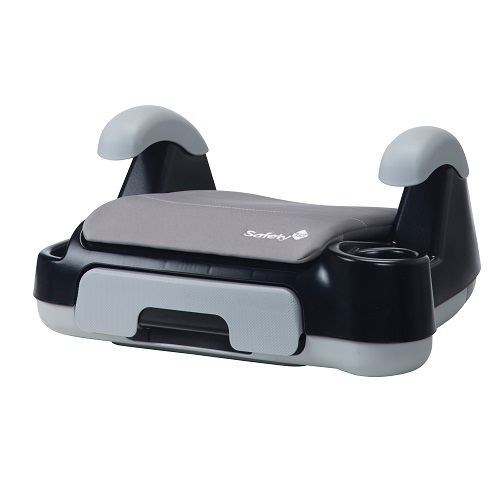 It is a dual-mode booster, which means it can be used in either high-back or backless mode. The cover is silky soft and should be appealing to most kids. 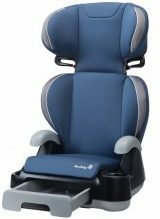 The booster seat bottom has reasonable leg support for taller kids while the headrest provides a comfortable resting place. 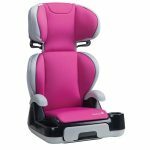 The Store ’n Go Sport is a booster that will easily last most children until they pass the 5-Step Test and can safely transition into an adult seat belt. External widest point: 18″ at the cup holder. Store ‘n Go Sport is currently available at Walmart and online at Walmart.com. There are 3 fashions, Dusted Indigo (Blue), Jetliner (gray), and Freesia (pink). The Store ’n Go comes out of the box with “some assembly required.” Next to the manual, which is stored on the underside of the bottom seat portion of the booster, there is a single sheet assembly guide. The difficulty of initial assembly is on par with other economy boosters made by Dorel, Harmony or Evenflo; expect it to take several minutes and don’t skip reading the guide. It’s not terribly hard, but it’s not 100% intuitive either. The Store ‘n Go is a “Some Assembly Required” booster. 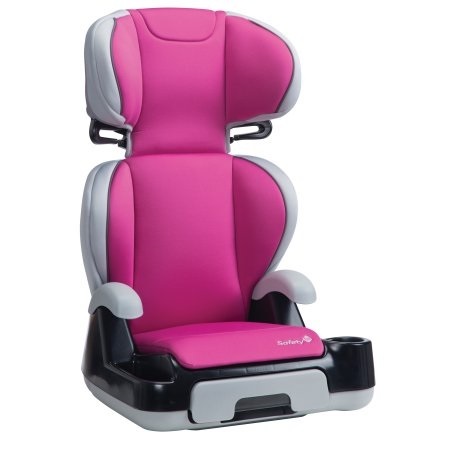 The 2014 version of the Store ’n Go received a IIHS Best Bet rating in highback mode and a Check Fit rating in backless mode. The new Store n’ Go Sport has not yet been rated, however, due to how little difference there is between the models, I anticipate the same rating. To adjust the height, remove the booster from the car and locate a plastic tab near the lumbar region of the back of the booster. 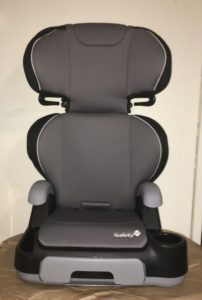 Pull on the tab to release the catch and move the headrest up or down. The adjustment is not easy or smooth, but hopefully it won’t need to be done often. The shoulder belt guides are on the bottom of the headrest on each side. You’ll want the shoulder belt guides to be above the shoulders so that the shoulder belt falls in the middle of the shoulder for best fit. 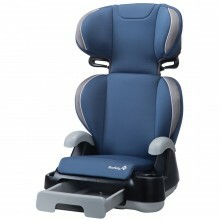 Once your child’s shoulder is even with the bottom of the belt guide (or is tall enough that the belt guide no longer properly positions the belt across the mid-point of the child’s collar bone) when the headrest is in its top setting, it’s time to take the back off and use the booster backless. 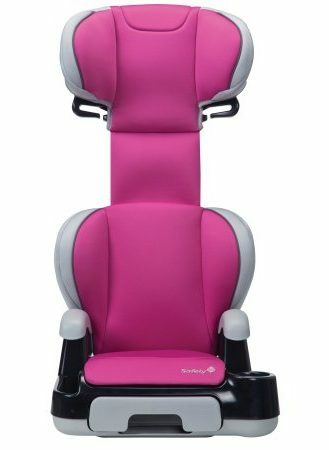 If the tops of your child’s ears go over the top of the *vehicle* seat back/headrest, then it’s time for a new booster or different option. If the tops of your child’s ears go over the top of the Store ’n Go’s headrest and there’s still a vehicle headrest behind the child’s head, the back can come off and it can be used backless. Just because the Store ’n Go got a Check Fit from IIHS in backless mode doesn’t mean it won’t fit your child well in that mode. It just means it may not fit all children optimally, so you need to check. Since there is no shoulder belt guide/strap for use in backless mode, shorter children will probably need the back on in order to get a good fit but taller children will likely do fine without it. You want to look for a shoulder belt that sits in the middle of the shoulder or slightly toward the neck and a lap belt that is touching the thighs. 53″ tall and weighs about 70 lbs. Our model is Aeryn, who is tall for her 7 years at about 53 inches and weighs about 70 lbs. The Stow ‘n Go fits her well with room to grow.The midpoint of the shoulder belt guide is adjusted to 22.5 inches above the bight of the booster seat; it has one more inch (23.5) it can be adjusted upwards before we would need to remove the backrest for her; at that point she should be almost tall enough to pass the 5-step test, at least in some vehicles. 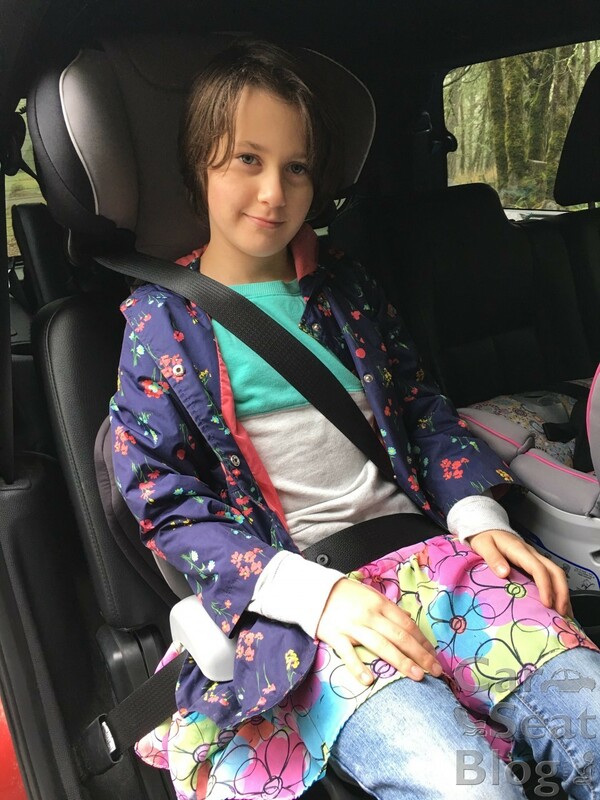 The Store ’n Go is reasonably narrow and we had no trouble fitting it next to another car seat that was installed in the center of our test vehicle, a 2015 Ford Expedition. There wasn’t a lot of room for buckling left over, but it was doable. 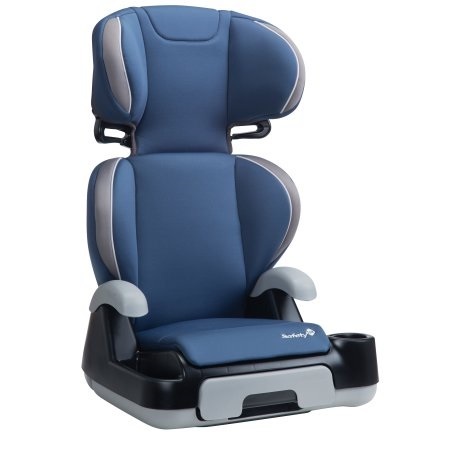 Without a child in the seat, there appeared to be a gap behind the back of the booster due to the slight forward lean of the vehicle’s head restraint; but the back is flexible and once a child was seated in place this gap disappeared. The hooks that are supposed to hold the lower elastic loops of the headrest fabric in place are sideways, but the loops attach from under the hooks at an angle which makes it impossible for the hooks to hold the loops in place. I referred to the assembly guide several times, sure I was doing something wrong, but nope – it’s just really badly designed. Sure enough, within about 10 minutes of having it assembled, those loops were hanging loose. Fortunately, it doesn’t seem to really be necessary to have them attached as the head cushion stays in place without them. The cover can be machine washed and dried on the gentle cycle and on low heat. There are instructions in the manual for removing the cover for washing. Because belt-positioning booster seats require the use of lap/shoulder belts, the Store ’n Go is not FAA approved and therefore cannot be used on an airplane. That doesn’t mean you can’t take it with you on the plane, though. 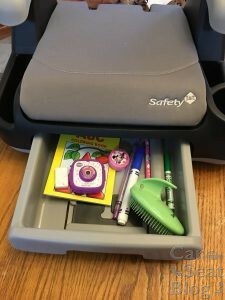 You can tuck the backless portion into an overhead bin as you travel so your child has a safe booster to sit in at your destination. The back is thin and light and may be disassembled and packed in a suitcase if your child will need it on your trip. The Store ’n Go has a lifespan of 10 years from the date of manufacture. The manual states that it must be replaced after any crash. Installation with Ford’s inflatable seat belts NOT allowed. 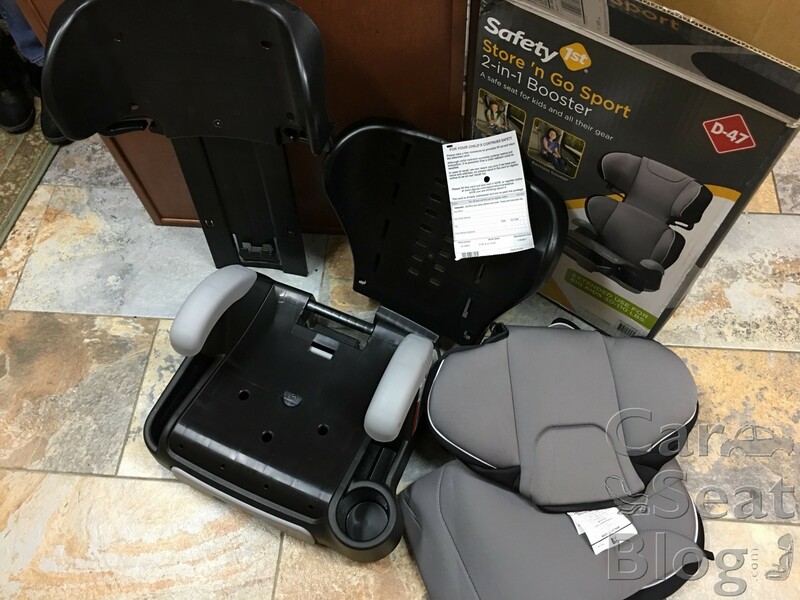 For the price, the Store ‘n Go Sport can be a great option for families who are looking for a tall, budget-friendly high back booster. This booster will also appeal to parents looking for ways to organize all their kids’ clutter in the car. 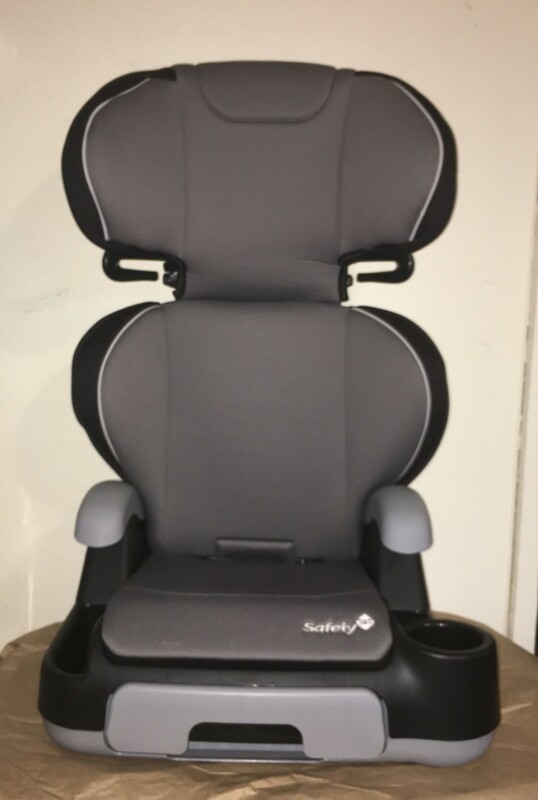 Due to the relative difficulty adjusting the height on the back, I would hesitate to recommend this for a situation where it will need to be adjusted regularly for differently sized children. However, for a single child who only needs it adjusted now and then for growth, I don’t feel this is a major drawback. 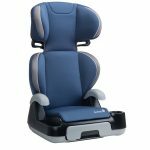 Overall, its generous height capacity is a great advantage for taller kids who can benefit from the added support of a high back booster at a point when most other high back boosters may be outgrown. The left side of the booster has a cup holder and a small storage compartment for snacks or toys. 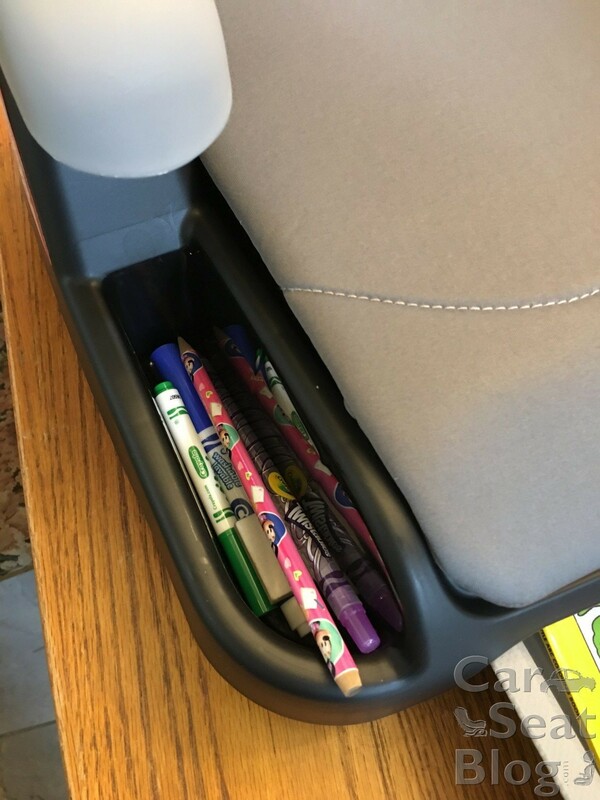 The right hand storage bin is good for longer items like markers. 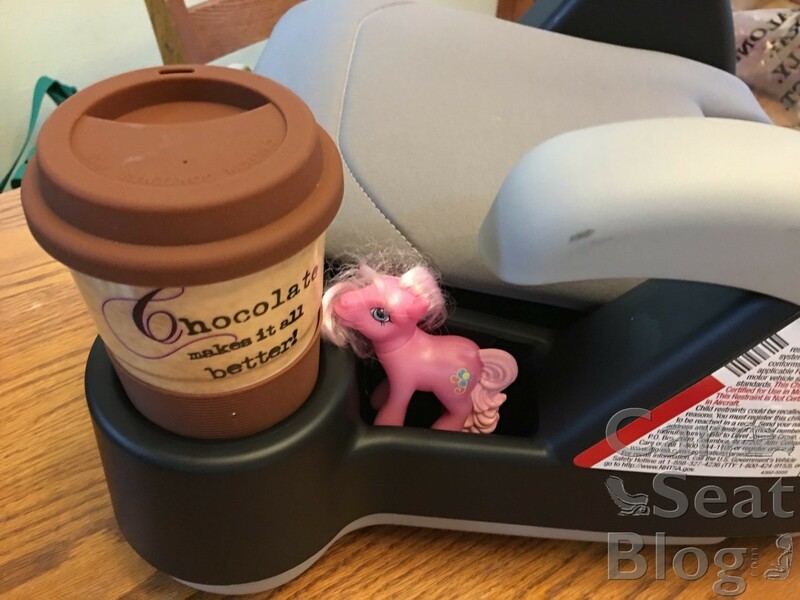 Thank you to Dorel for providing the Store ‘n Go Sport booster used in this review. No other compensation was provided. All opinions expressed are those of CarseatBlog. How does it do in a Dodge Caravan? 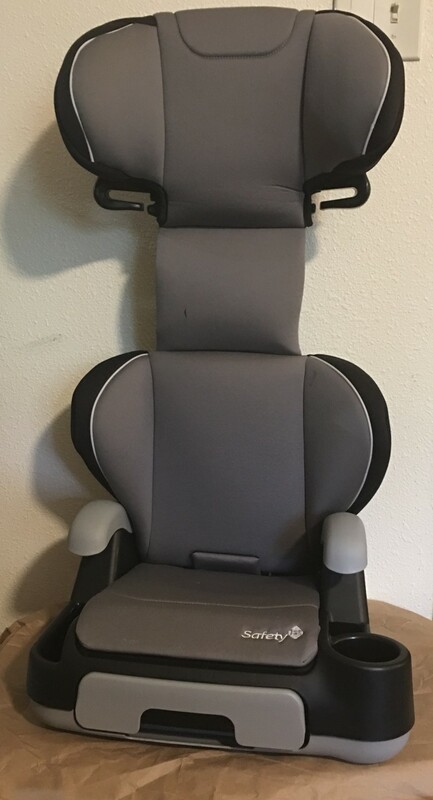 My kiddo currently has an Evenflo Spectrum (in my mom’s van) that I bought because it was tall and supposed to work there, but it actually gets hung up horribly.